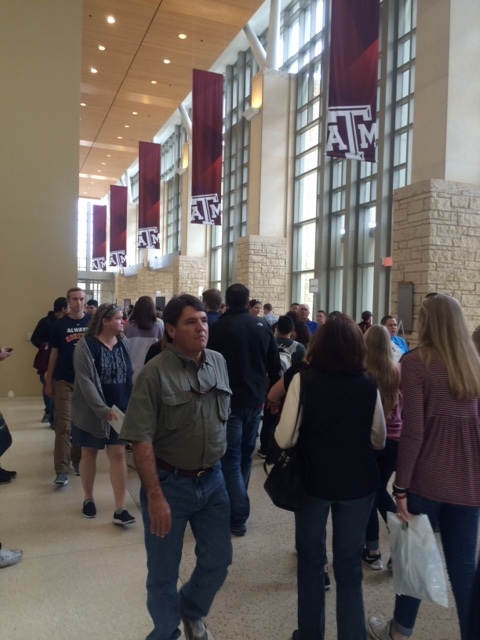 Trip Log – Day 230 – College Station TX | How Will We Live Tomorrow? To understand the pivotal relationship that College Station TX has played in my life requires suspension of rational thought and action. Are you game? Before I was born, before my parents were married, before my father fought in World War II, Mickey Fallon was a fresh recruit, a wannabe gunner. The army sent him to College Station for a few weeks training. He was enthralled by Aggieland. My father went on 52 bombing missions over Germany, returned to his construction roots rather than get a GI Bill education, married a beautiful though incompatible woman, and banged out a bunch of kids. I am number four. Through my youth, my seat at our kitchen table in Toms River, New Jersey, was crammed against the wall beneath a gigantic map of the United States. A thumbtack marked College Station, Texas. The taller I grew, the closer I got to Texas A&M. My father, despite his own disinterest in college, wanted all of his sons to be Aggies. My oldest brother was accepted and joined the Corps of Cadets. Number Two didn’t have the grades, but my dad arranged for him to go to a Texas junior college that might serve as a feeder. By the time my sister went to a state school in nearby Nacogdoches, there were more Fallon kids in Texas then not. Dad put the pressure on mom to make the move to the Lone Star State. He almost s ucceeded. Mom agreed to leave New Jersey but refused to suffer the Texas heat. So, my parents negotiated a latitudinal meeting point along the 100th meridian, which is how they wound up moving my little brother and me to Norman, Oklahoma in 1973. If you find logic in this process, welcome to my family. 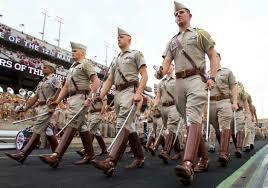 My oldest brother dropped out of the Corps, and then out of A&M completely. My next brother never completed junior college. My sister escaped Texas by marrying her high school sweetheart. Still married 45 years later, she made a good choice. My father never found his stride in Oklahoma. His business faltered. My mother went to work. She gained confidence. His dream dwindled. 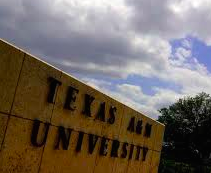 I never even applied to Texas A&M. Instead I returned back East, among the elites my father disdained. Eventfully my parents divorced. Dad returned to New Jersey and married a young woman who made him very happy. Meanwhile all the other people he displaced stayed in Oklahoma or migrated further West. 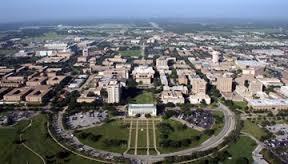 Today was Aggieland Day at Texas A&M. I spent the morning in Memorial Union surrounded by eager high school students exploring this spirited place. It was easy to see what my father wanted for us. 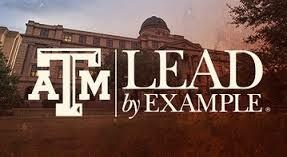 Texas A&M is a place of individual excellence and collective strength; bursting with pride of purpose. 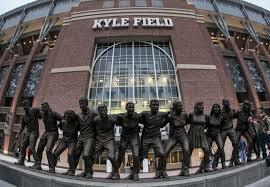 One could discount my father’s dream as a failure; none of his sons are Aggies. But that sprawling map on the wall of my childhood kitchen was my first introduction to the breadth of this amazing country. It triggered the idea that the United States could, and should, be explored. So here I am, seventy-five years after my father came to College Station, enthralled by the Aggies. 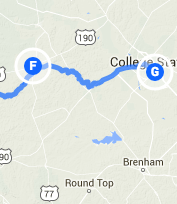 This entry was posted in Bicycle Trip Log and tagged Aggies, College Station TX, Texas A&M. Bookmark the permalink. This post practically wrote itself. i did it in like twenty minutes. A boy needed a sense of humor to survive my family. I feel like all these parts of my life pop up and hit my over the head on this journey. Pingback: Trip Log – Day 359 – Pauls Valley OK to Norman OK | How Will We Live Tomorrow?